The ClosetMaid Impressions Narrow Closet Kit features a premium, embossed chocolate finish with a decorative side and top moldings. The organizer features 8 shelves and 3 closet rods that expand from 30 to 48 in. 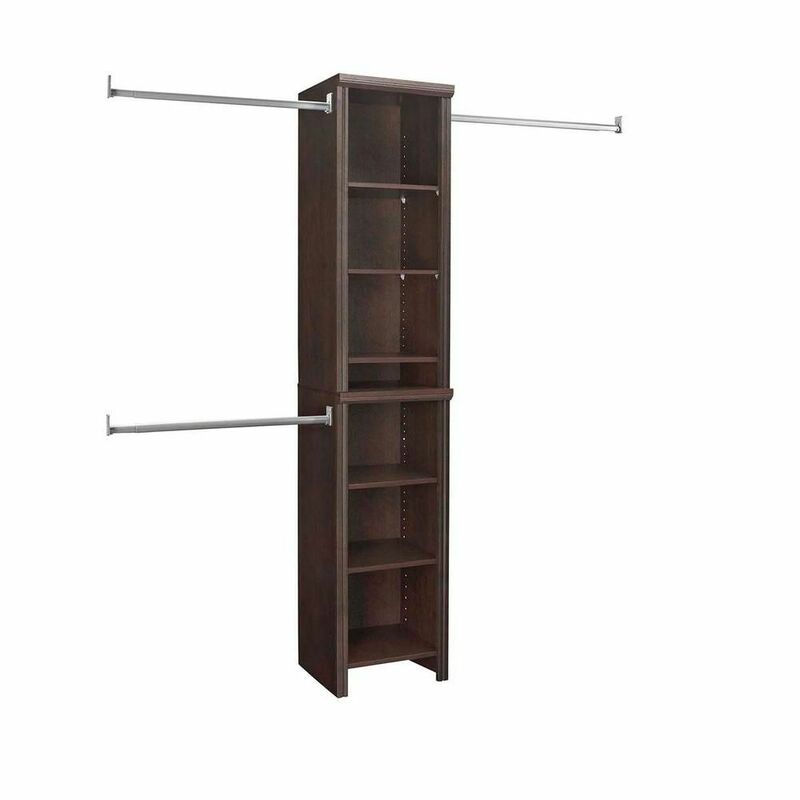 for versatility and to increase the usable space of your reach-in closet. You can add top shelves and drawers to create a custom solution. You can even choose to secure the cabinet to the wall with the included hardware for added safety and stability. Manufacturer will replace any missing or damaged parts. Please call Customer Service at 1-800-874-0008 for warranty information. The ClosetMaid Impressions 25 in. Deluxe Drawer Kit features a premium embossed dark cherry finish with a decorative panel front and stylish metal handle. The full-extension ball-bearing glides offer smooth operation and provide easy access to clothing, while the durable laminate construction ensures lasting use. This drawer is designed to fit with the ClosetMaid 4-Shelf Organizer or Closet Kit (both sold separately). ClosetMaid Style+ is a stylish, yet affordable organization solution. The clean, versatile design creates shelving storage in closets and throughout the home. The corner shelving tower can be used alone or in combination with other Style+ items, creating a personalized solution. The melamine finsh also increases durability. Create your own custom closet with the ClosetMaid Impressions 16 in. Drawer Kit. The drawer features a premium, embossed chocolate woodgrain finish with a decorative raised-panel front. A stylish matte silver handle offers a sleek look while the drawer extends fully on smooth, ball-bearing glides. It is designed to work with the ClosetMaid narrow 4-shelf organizer and the narrow closet kit. The ClosetMaid Impressions 25 in. Deluxe Drawer Kit features a premium embossed chocolate finish with a decorative panel front and stylish metal handle. The full-extension ball-bearing glides offer smooth operation and provide easy access to clothing, while the durable laminate construction ensures lasting use. This drawer is designed to fit with the ClosetMaid 4-Shelf Organizer or Closet Kit (both sold separately). Impressions 4 ft. to 9 ft. W Narrow Closet Kit in Chocolate The ClosetMaid Impressions Narrow Closet Kit features a premium, embossed chocolate finish with a decorative side and top moldings. The organizer features 8 shelves and 3 closet rods that expand from 30 to 48 in. for versatility and to increase the usable space of your reach-in closet. You can add top shelves and drawers to create a custom solution. You can even choose to secure the cabinet to the wall with the included hardware for added safety and stability.